Facebook launching Product Ads in Power Editor. Twitter unveils mobile analytics tool. These stories, and more, in today's Morning Social Media Newsfeed. Facebook announced on Tuesday a way to highlight one or more products in an ad. Named Product Ads, Facebook has been testing this for a while (and multi-product ads are available in Power Editor), but announced a full rollout on Tuesday. Product Ads will be available through Power Editor in the coming weeks. Adweek The Menlo Park, Calif.-based company is calling Product Ads “a solution designed to help businesses promote multiple products, or their entire catalogs, across all the devices their customers use: phones, tablets and desktop computers.” Businesses will be able to upload their product catalogs and let Facebook generate ads for items while targeting them to users. VentureBeat Using Facebook’s Custom Audiences, marketers can target their ads at users who visited their website or their apps, or can aim the ads at people who have indicated specific interests or who are in specific geographic locations. 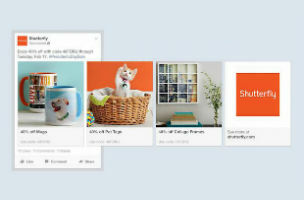 At the same time, Facebook said, advertisers can curate their messages however they want. The Wall Street Journal/Digits The move is Facebook’s latest effort to elbow in on a lucrative and growing part of Google’s turf. Retailer spending on Google Shopping ads surged 47 percent in the fourth quarter, compared with the same period of 2013, according to Adobe. Twitter is super keen on being more than just a place for your random thoughts on current events. In addition to its Mo Pub ad platform, it’s also going after developers with its Crashlytics service. Comedy Central has been fairly quiet since announcing the Roast in January, but Tuesday it released a teaser trailer exclusively on Facebook. Bieber’s in on the fun too, posting the trailer to his own Facebook page (which boasts a cool 77 million likes). Facebook appears to be testing a feature that alerts users who include hashtags when their friends have used the same hashtags. Reader Matteo Acitelli shared a screenshot, in which the Google+-like “+1” indicates that one of the poster’s friends posted the same hashtag. The U.S. government isn’t just fighting ISIS on the ground — it’s also been battling the terrorist group online, trying to counteract ISIS’ propaganda with messaging of its own. But those efforts have not been particularly successful, according to The New York Times, and now the U.S. government is hoping to streamline and strengthen its messaging in an attempt to counteract ISIS’ work. Facebook announced in October that the Facebook Preferred Marketing Developer ecosystem was undergoing an overhaul, becoming an objective-focused Facebook Marketing Partner program. That change took place Tuesday. Police are searching for a 14-year-old girl who ran away from her Northwest Side home after an argument with her mother over social media. Kassandra Terraza ran out of her home in the 3800 block of North Laramie about 9:20 p.m. Sunday after arguing with her mother about social media, according to a missing person alert from Chicago Police. Social game developer Zynga has announced its Q4 2014 financial results, reporting bookings of $182.4 million, up 4 percent quarter-over-quarter. The developer of Facebook and mobile games saw mobile bookings represent 60 percent of the total bookings for Q4 2014, up from 34 percent in Q4 2013.